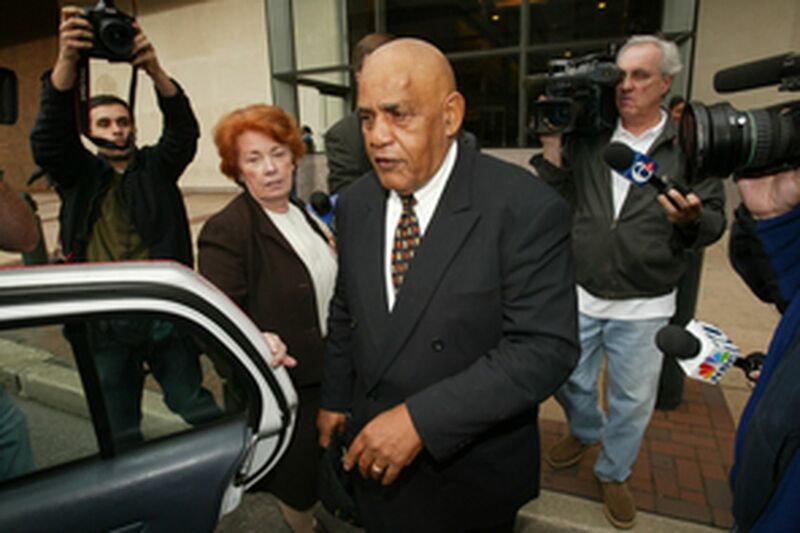 Jeanne Damirgian, appointed to defend T. Milton Street against fraud charges, leaves court with him in this November photo. Yesterday, she told a judge that Street "vehemently opposed" her counsel. THE LAWYER representing T. Milton Street on fraud and tax-evasion charges got the green light from a federal judge yesterday to quit the case. The lawyer, Jeanne K. Damirgian, had been appointed by the court to represent Street, the mayor's controversial brother, in April 2006. Damirgian told U.S. District Judge Legrome D. Davis she wanted to withdraw from representing Street because they have "very divergent views" on how the case should proceed. Damirgian, a former federal prosecutor, said that she had proposed several defense strategies in recent weeks but that Street was "vehemently opposed" to them. Under questioning by Davis, Street, 67, said that he no longer wanted Damirgian to be his attorney and that he didn't see any way the two could work out their differences. After a brief conversation with both Damirgian and Street, Davis granted her request. Street, dressed in a black striped sweater, black slacks and brown shoes, said he could not afford his own attorney and asked Davis to appoint a lawyer for him. Davis said he would do so quickly but wanted Street's assurance that he would "give 110 percent" to working cooperatively with the new lawyer. After the hearing, Street declined to discuss what his differences with Damirgian were. "There's no redeeming value in getting into that," he said. One possible explanation for the breakup may have been that Street seemed preoccupied with just about everything recently - except, perhaps, his own defense. Street stunned political observers when he announced on Feb. 15 he was running for mayor. Four days later, he was busted by police as he was leaving a 7-Eleven in Moorestown on outstanding traffic warrants from 2004. He was later released after posting $3,250 bail. The following day, Feb. 20, Street told a gaggle of reporters he'll drop out of the mayor's race if fewer than 5,000 supporters show up for a noontime rally at City Hall on Thursday. That same day he called mayoral candidate and former City Councilman Michael Nutter "a watermelon man," a reference to the 1970 movie "Watermelon Man," in which a white man (portrayed by a black actor) morphs into a black man. Nutter said it was "absolutely incredible" that somebody facing a federal corruption trial would offer himself as a candidate. Last Thursday, Damirgian filed court papers saying her professional relationship with Street had "deteriorated," the two had "irreconcilable differences," and she no longer wanted to represent him. Asked yesterday if Street's recent political activities had contributed to her decision to withdraw from the case, Damirgian smiled and said: "I can't answer that question." Street is scheduled to stand trial May 14 on charges that he failed to report more than $2 million in consulting income to Uncle Sam. The feds allege that Street also tried to defraud an airport contractor.